Home / Indian Football / I-League / Chennaiyin FC U-13s trash Chennai City FC 8-0 in big win! The Chennaiyin FC U-13 team romped to an 8-0 win over Chennai City FC U-13s in a 2018-19 Hero Sub-Junior League away game at the Chettinad School Ground in Kelambakkam today. Hattrick hero Ajay Kumar M. was the standout performer for Chennaiyin FC as Rishibarath N. also starred with a brace. 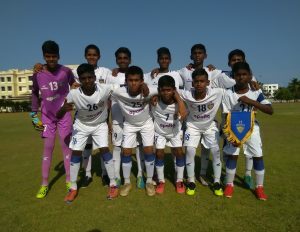 The Chennaiyin FC U-13s have now scored 32 goals in six games this season in the Chennai zone with ten different players already getting on the scoresheet so far. The Chennaiyin FC U-13s will face the Raman Vijayan Soccer School U-13s in their next outing on Tuesday, April 16 at the MVM School Ground. The Chennaiyin FC U-13s were unchanged from the side that defeated Great Goals U-13s 2-0 last week. It was all Chennaiyin FC from the outset, who took the lead in as early as the sixth minute. From a corner, Chennaiyin FC defender Mohan Raj rose highest to head it in. Midfielder Ajay Kumar M. got into the act few minutes later, when he headed home G. Arulesh’s chipped assist from the left flank. Chennaiyin FC midfielder Srinith K. was running the show in the middle of the park as his side continued bossing proceedings. He set up Rishibarath N. with a quality pass in the 28th minute, who smashed it in to make it 3-0. It was 4-0 to Chennaiyin FC soon after, when Mohamed Irfan’s delightful curling cross from the right flank was turned in by Ajay for his second of the afternoon, and his fourth goal this season. Srinith then got the goal he deserved in first half stoppage time, when he struck home the rebound following Varun Kumar’s shot inside the box. Chennaiyin FC went into the break 5-0 up. There was no respite for Chennai City FC after the break, as Chennaiyin FC continued their goalscoring spree. It was a moment of brilliance in the 39th minute, as Rishibarath netted with a powerful drive from outside the Chennaiyin FC box. Ajay then scored his hattrick soon after, finding the back of the net with a well-taken free-kick after a foul by a Chennaiyin FC defender. Substitute E. Kannan then assisted Chennaiyin FC’s eighth goal of the afternoon, when he set up Arulesh in the box, who headed home with aplomb. Previous AIFF League Committee meets to discuss in Bhubaneswar! Next XtraTime VIDEO: Durand Cup to come under AIFF calendar from next season!